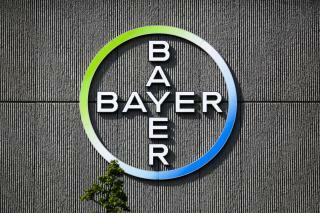 (Newser) – After months of courtship, German drug and farm chemical maker Bayer AG has finally reached an agreement to buy US seed and weedkiller company Monsanto, in a deal valued at $66 billion, the AP reports. In a statement Wednesday, Bayer said it's paying Monsanto shareholders $128 per share in cash, representing a 44% premium over Monsanto's closing price on May 9 (the day before a proposed deal was announced). The $66 billion figure put on the deal by Bayer includes net debt; the equity value is $57 billion, according to slides for an analyst conference call. Monsanto shareholders must approve the deal, expected to close by the end of next year. Anti-trust regulators are also expected to scrutinize the tie-up to determine whether the new business would gain a market-dominating position in any one part of their business. Bayer agreed to pay a $2 billion fee if the deal doesn't go through. Nice touch with a title. The new company logo BM sums up the entire genetic nightmare that both companies have unleashed in the name of profits.